In just a few short years, AMC went from that channel that considers Patch Adams an “American Movie Classic,” apparently, to the paradigm of basic-cable programming, the one that everyone wanted to emulate. But as anybody who reads these things regularly knows, the shine is wearing off. Rubicon limped to a close after a single season, rage over The Killing tore the Internet in two, The Walking Dead, while a huge hit, began showing some troublesome flaws early on—and, most recently, lost showrunner Frank Darabont. Most unfortunately, the buzz around the new Hell On Wheels is that it’s not very good, suggesting a worrisome spiral for AMC that matches its equally rapid ascent. And as laid out in this Los Angeles Times article, those woes could even end up costing it one of the series that got it there in the first place: Breaking Bad. The LAT reported that “tense negotiations” were taking place between AMC and Sony over a fifth season of the drama, which creator Vince Gilligan has said recently is where he would like things to end. Unfortunately for all of them—and for all of us—those talks remain at an impasse, with Sony even reportedly reaching out to other cable networks about taking on Breaking Bad should the deal fall through. It’s a situation much like the shaky renewal process for Mad Men, which ended with a lucrative deal for Matthew Weiner that, ironically enough, is now the source of all AMC’s other renewal woes. 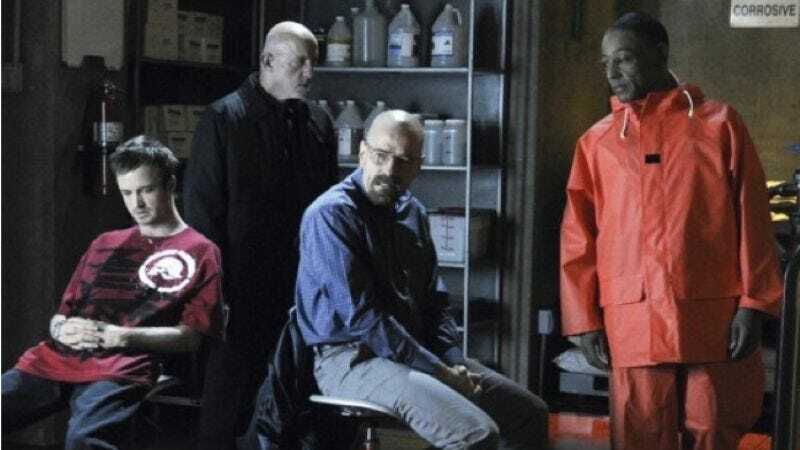 And once again, it all comes down to money and network-imposed limitations: Not only does AMC want to lower overall production costs, it also wants to shorten Breaking Bad’s final season to only six or eight episodes, as opposed to the usual 13. Naturally, the show’s creative team rejected that idea, which is why it began quietly shopping around for a Plan B. Of course, as the LAT points out, a new network would probably ask that they drag the show out for more than just one season, which could be its own less-than-ideal compromise. But before we begin prematurely lamenting that, the New York Times now says promisingly that the tone of the talks has improved, that the lowered episode count is “no longer on the table,” and that there was more optimism that a deal would be reached, although that’s still forthcoming. To state the obvious unnecessarily, really, the best thing for everyone—not least the increasingly dodgy-looking AMC—is to keep one of its crown jewels right where it is ,and allow it to finish properly, whatever the cost. In fact, there are rumors (though officially denied by the network) that these exact sorts of cuts are what led to Frank Darabont’s abrupt departure from The Walking Dead. Whether true or not, hopefully AMC executives don’t want to see something like that happen with Breaking Bad. We certainly don’t. So Vince Gilligan and Co.: Break out the box-cutter and make your point.